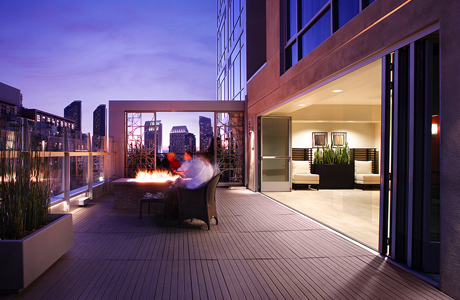 The Gaslamp Quarter is on of San Diego's main entertainment and tourist attractions. It was settled in the 1860s, as a way to connect the city to the marina. Unfortunately, many of the 94 historic buildings became mired in urban decay. 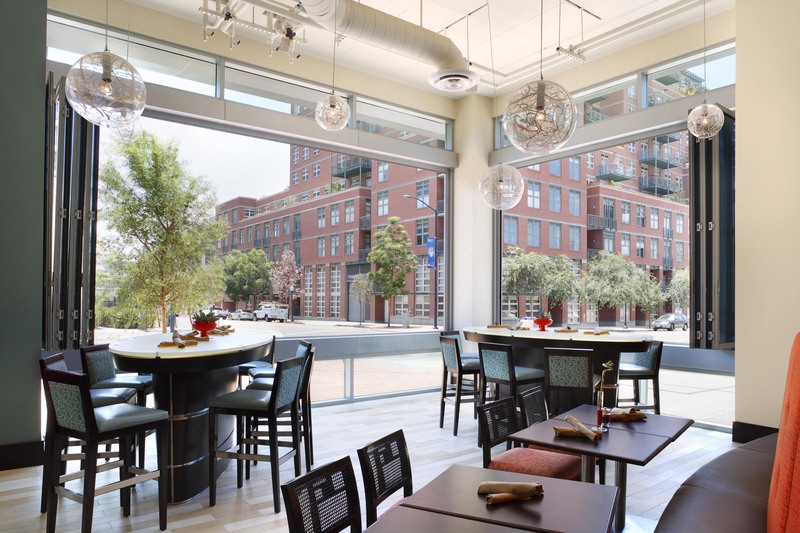 Around the 1990s this began to change with the legendary revitalization that also spread to nearby sections of downtown San Diego, including the up and coming East Village, with its startling Hotel Indigo. Joseph Wong Design Associates (JWDA) designed this steel and glass hotel to appeal to travelers tired of bland “beige box” hotels. JWDA were faced with another design problem: how to integrate the hotel into urban fabric but maintain the outdoor aesthetic of San Diego. One solution was the installation of operable glass wall systems in two different locations. 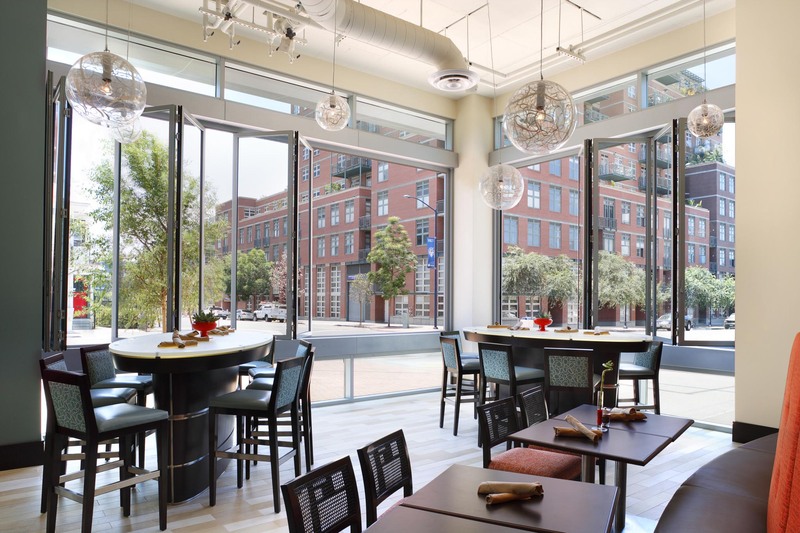 JWDA was founded in 1977 and hospitality architecture represents 80% of their work. They have completed many waterfront projects in San Diego but their reach has stretched as far as Korea and China. The twelve story Hotel Indigo resides in the East Village section and opened in the summer of 2009. “The vision was about having a nice addition to a neighborhood that is really transforming,” stated Wong of JWDA . The first LEED certified hotel in San Diego, Indigo has many green features. 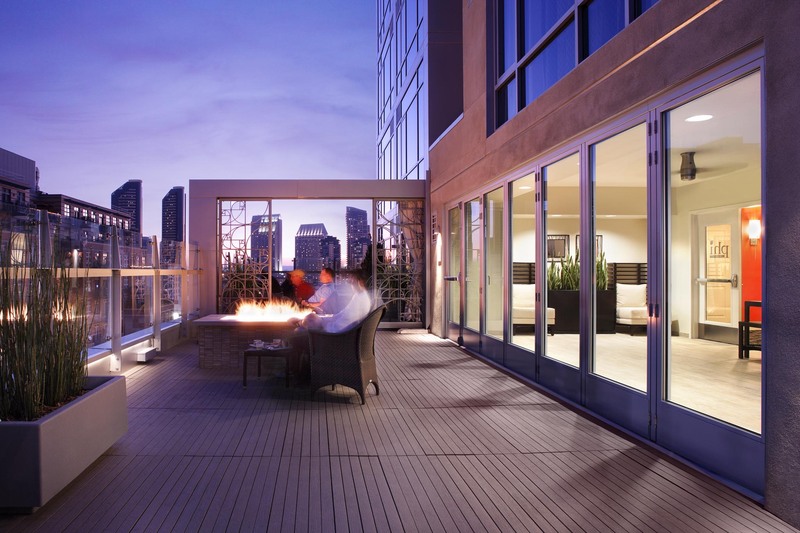 The 9th and 12th floor roofs are covered in sedum, and the 9th floor Phi Bar Terrace deck uses Moisture-Shield composite decking made from recycled polyethylene plastic and wood fibers. 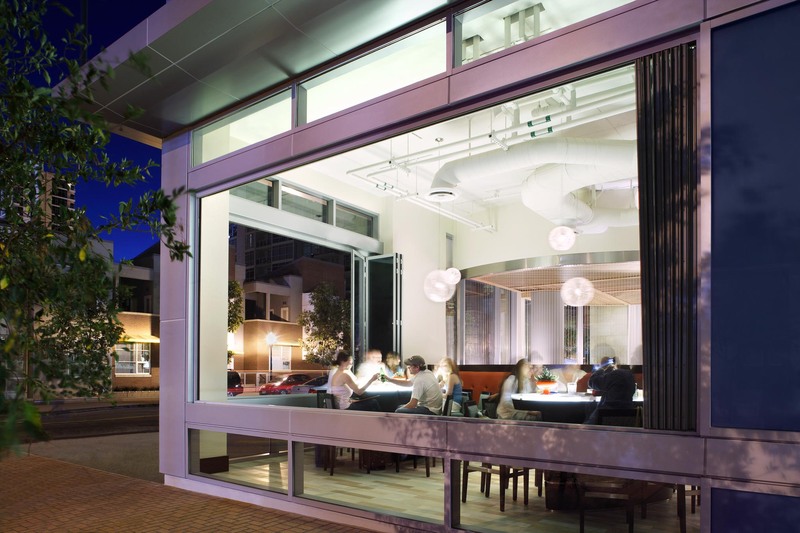 Moreover, the bar terrace has floor-to-ceiling SL70 NanaWall systems, which allow for natural ventilation and light. 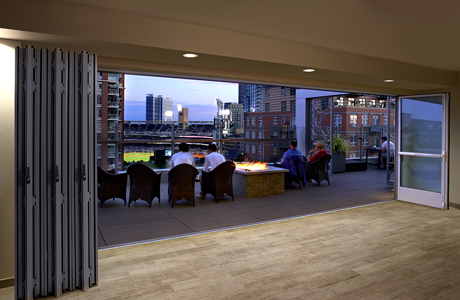 The Phi Bar Terrace overlooks nearby PETCO Field and one can see the nearby marina. The InterContinental Hotel Group owns the Indigo Hotel, and the basis of their brand design is Fibonacci sequence and the Golden Mean. Similar imagery can be found on “Indigo Waters”, the 40-foot wall sculpture on the curved wall of the façade. On a smaller scale, the imagery was deployed on chair backs, floor patterns, light fixtures and even on the Phi Bar terrace metalwork . 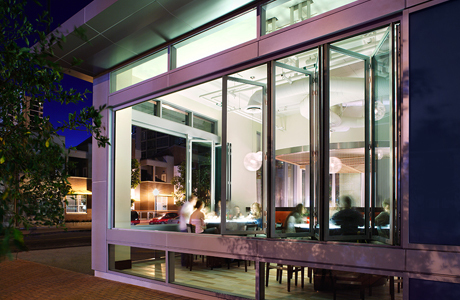 The first floor Table 509 Bar and Restaurant also utilized a NanaWall corner system. 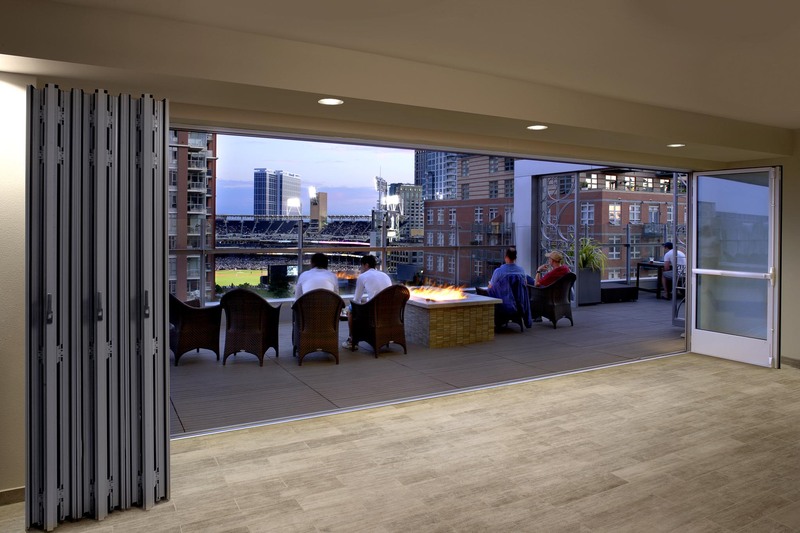 The SL45 windows retract, bringing in the excitement of Island and 9th Avenues and the bordering Gaslamp Quarter. 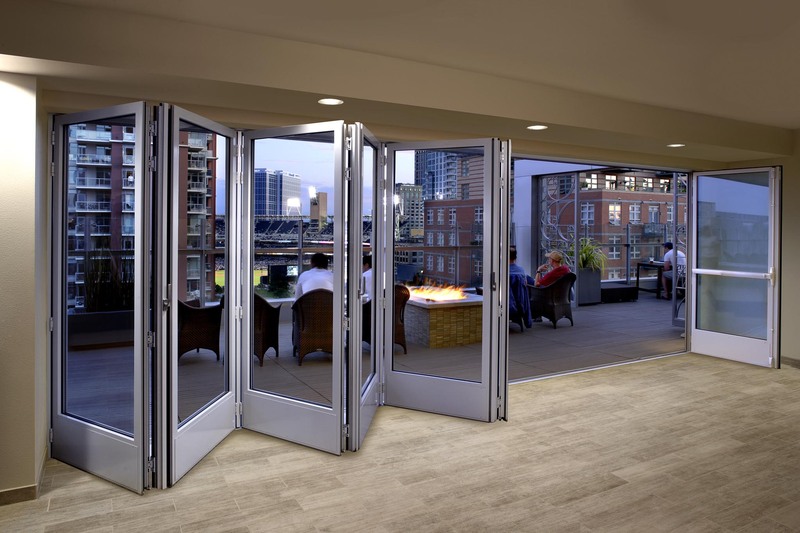 Because NanaWalls have excellent sound attenuation, the windows can be closed and secure privacy for the interior spaces. 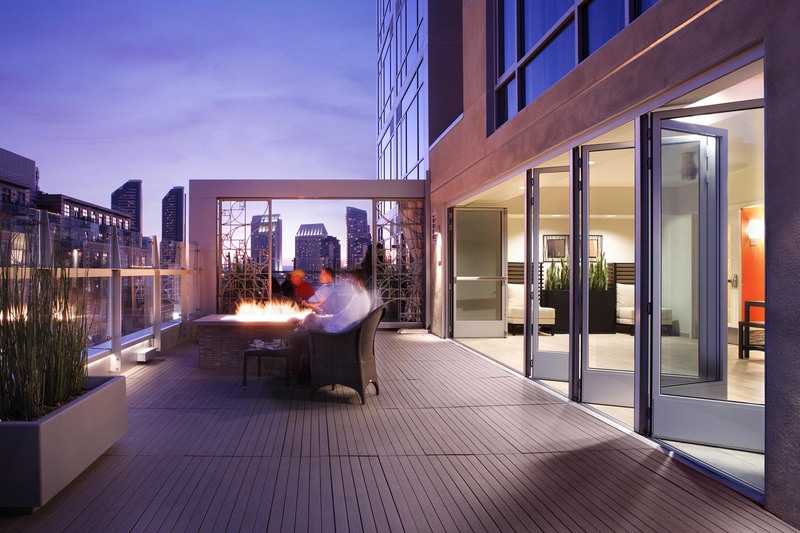 NanaWalls can be custom designed for large openings, which can be seen on the 1st and 9th floor systems. 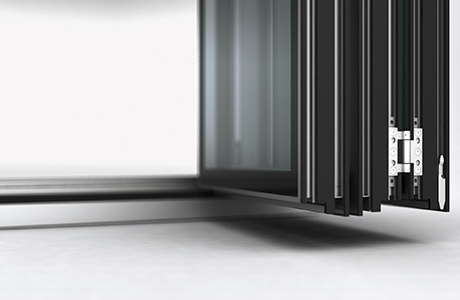 The elegant, precision engineered NanaWall meets the most challenging architectural specifications. 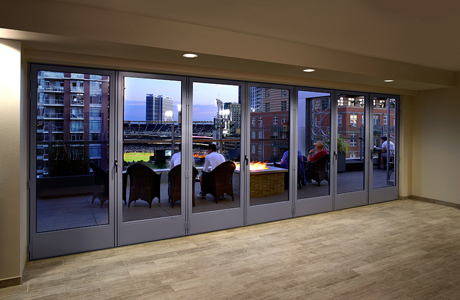 The custom made NanaWall is available in aluminum, wood or clad frames with a selection of over two hundred colors. Independent testing confirms that many NanaWall systems meet or exceed industry standards for air infiltration, water penetration, thermal performance, forced entry, acoustic and hurricane requirements. “The NanaWalls not only give a unique perception of our hotel, but create a new experience for our guests when the doors are wide open. They have a wonderful fluid function with no maintenance." 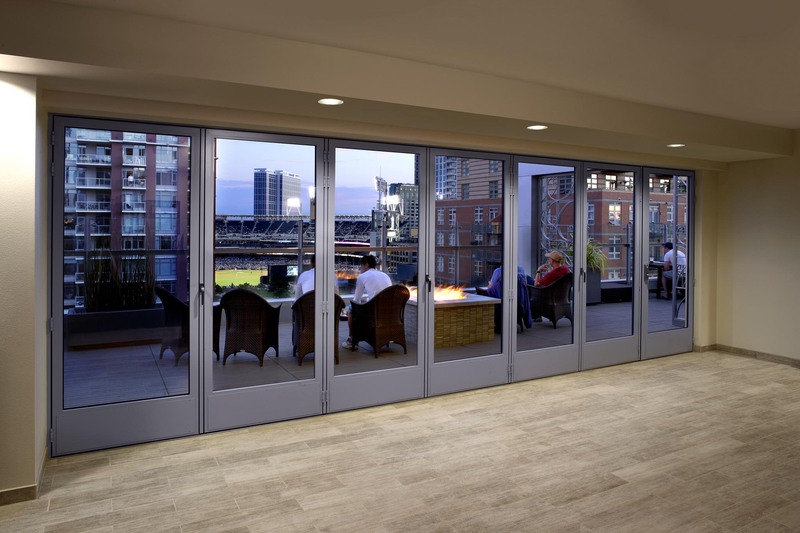 “Using the NanaWall as a window system instead of a door system controls access to the space, while allowing it to feel completely open, blurring the line between interior and exterior."